Kladder Update: Easter & Happy Birthday Kladder Kids! 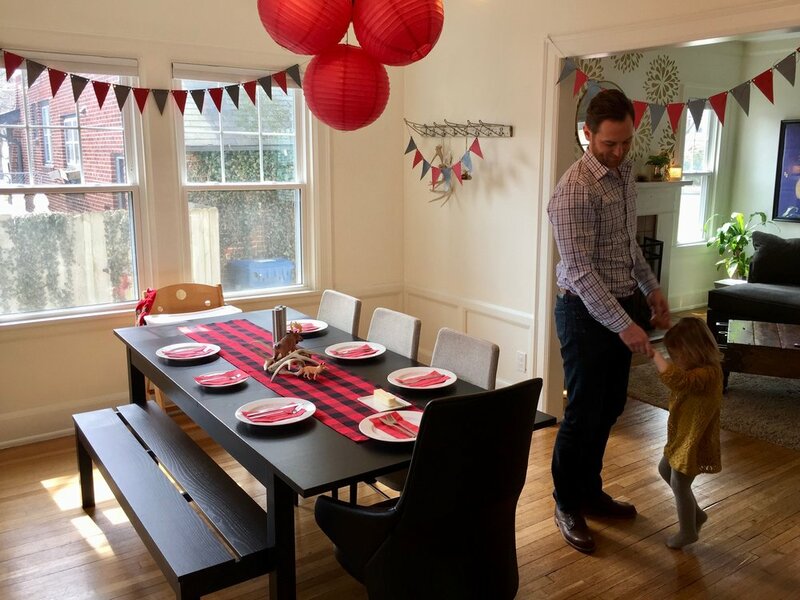 Our dining room turned into party central last weekend as we celebrated both Thomas and Natalie's birthdays - sorry, kids, get used to it... your special days are only 3 weeks apart. Thomas turned one-year-old on March 27th and Natalie will be young-wild-and-three on April 16th. I did some 'momming' and put together some woodland themed decor for the event with family using red and black as our color scheme. Full disclosure: I repurposed the pennant banners from my sister-in-laws bridal shower, ordered the table runner on Amazon for $8 and got the cake from Meijer Bakery, which deserves a huge shout out... not only did it look and taste fabulous, but it was only $11.99. Tell all of your friends. Thomas really-really enjoyed his chocolate birthday cake and Natalie was thrilled about her gifts: an incredible wooden playhouse for the backyard from Grandma and Grandpa and a super cute metal tea set from her Aunt and Uncle. We doubled down on family time last weekend and also celebrated Easter Sunday while my folks were in town. 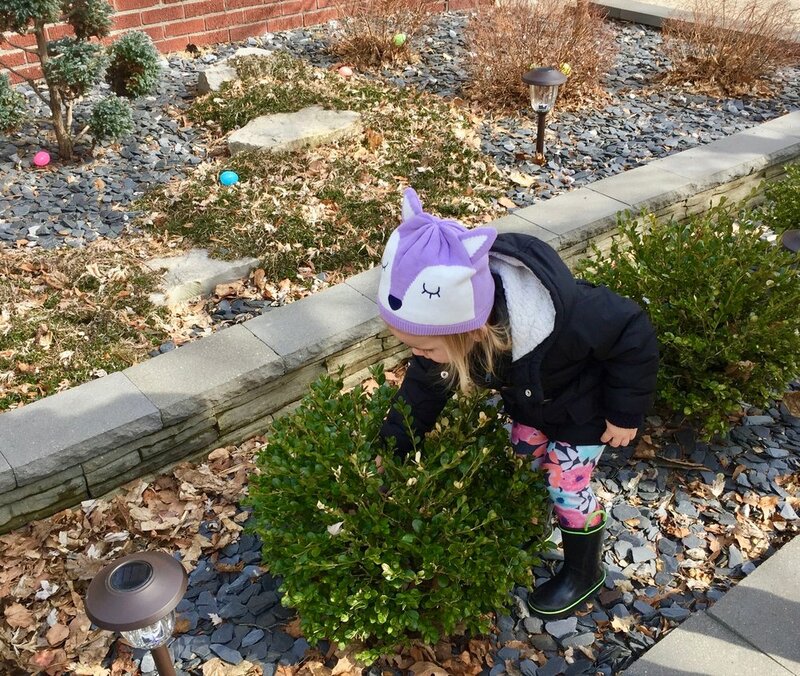 The entire family shivered in the cold as we watched Natalie do her solo Easter egg hunt around the yard. I should have learned my lesson from last year NOT to fill the eggs with candy - that only slowed us down. We opened Easter baskets and ate ham - which is the gift that keeps on giving this week in the form of sandwiches. You know what I'm talking about. So good. That same morning we dressed in our Sunday best (always fun on Easter) and headed over to Grandville for Easter service at Mars Hill. The place was 'hop'n' (pun intended) and the crowd was looking good - all those sweet little Spring outfits really get me! Our pastor AJ spoke about 'believing' and asking for guidance in our 'unbelief'. Mars Hill continues to be a solid place for us to worship and build our relationships with God and our community. Two weeks ago Jeff and I took a few days off as parents in Chicago for a weekend of fun with friends. My parents took our kids for two nights (thanks Mom & Dad) and we savored the mornings of laying aimlessly in bed, uninterrupted adult conversation during dinner, spur of the moment planning and ridiculously late bedtimes. Those were the days. I wrote all about our weekend away HERE. U of M lost the NCAA Championship Monday night and Jeff is super sad. He watched the game with his guy friends and I'm just glad he made it home alive. Honestly, there was a higher chance of losing him had they won. I'm only half kidding. More news in sports, we checked out the Griffins Hockey game last Friday with friends for $2 beer night. Griffins won 3-2 over the San Jose Barracudas which doesn't matter much to me. I just like the games for the cheap beer and the people watching. It was a fun Friday night out topped off with our usual nightcap at Bob's Bar on Michigan Ave. It's the simple things. Last, if you haven't noticed already, I'll point out our updated webpage banners. With both the kids celebrating birthdays it made for a perfect time to snag some new photos of each of them and some candids for the site. Jeff absolutely hates getting his photo taken but he tolerates me nonetheless. The photos were done by our very favorite, James Richard Fry, who's taken our family photos since before we were a family. His work is littered all over this blog site and we couldn't say enough wonderful words about him. Thank you James! Next on the horizon for us Kladders is a whole lot of praying for this weather to clear up! We're aching to get on the golf course A-SAP and seeing all your beautiful photos from Florida isn't helping much! Enjoy the rest of your Spring Breaks and please bring home the sunshine with you! POSTSCRIPT - Mark your calendars!!! Runway on the Rapids benefitting the Multiple Sclerosis Program at Mercy Health is coming on Friday, April 20th at the JW Marriott. We've got our tickets and you should too! Tickets include admission to the fashion show, light apps and cash bar. It's a good time and for a great cause! See you there. Watermark Women's Association is hosting our Annual Spring Mixer on Wednesday, April 18th at 6:30pm. Interested in golf? Interested in Watermark? Interested in meeting fun gals? Come see what we're all about.